Artisan sundials are real sundials, pure and simple. Our original sun clocks are specially designed and constructed to provide accuracy as well as a genuine sense of presence in time and space. Unlike most of the mass produced commercial sundials you will find in your local garden center, Artisan sundials are authentic scientific instruments that are carefully constructed and capable of telling very accurate time. If you are looking for reasonably priced authentic sundials that actually work and can be personalized to celebrate a special occasion you have come to the right place. We are now pleased to offer Jim Tallman's signature Spectra sundial, a unique custom timepiece devised to fill the room with intense rainbow color while accurately marking the passing hours. These special glass indoor sundials can be personalized at no extra charge with special date lines and inscriptions to make the perfect wedding, anniversary, or birthday gift for the person who has everything. The multitude of beautiful spectra that these splendid handmade custom sundials create will provide many colorful days and celebrate a special occasion for years to come. The Spectra sundial is the first Artisan sundial to be offered on the internet, and to date there are Spectra sundials keeping accurate time and creating colorful moments in 47 US states and 18 countries on 4 continents. 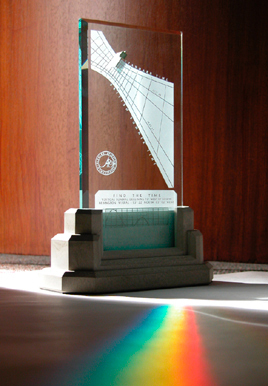 The sun never sets on the Spectra sundial - there is one in the daylight 24 hours a day. Have a look at our interactive World of Sundials to get an idea which ones are in the light of day right now! Sundial designer Jim Tallman has been designing and making sundials for over 40 years and is a long time member in good standing of both the North American Sundial Society and the British Sundial Society. In addition to designing and personally handcrafting his unique sundials, Jim also helps commercial or private clients create authentic original sundials and functional sun sculptures to enhance their public or private spaces. Architects and landscape planners who may not feel comfortable predicting celestial mechanics or doing spherical trigonometry often have Jim do the underlying calculations and layouts for their own sundial designs, to ensure the accuracy and successful outcome of any special sundials that they plan to add to their own consultant projects. Jim has many more original Artisan sundial designs currently under development - some of which are universal and will work anywhere on the planet right out of the box. Watch this space for new Artisan sundials to appear as they become ready...new ideas are indeed taking shape!